American horror movie specialists Anchor Bay released these four Region 0 (NTSC) DVDs in what they rather cheekily call the “Dario Argento Collection”, and in doing so made legions of the director’s fans very, very happy indeed. Anyone who tried to get decent copies of Argento’s movies while VHS was the only available format will remember the frustration of trying to find the optimum version, preferably with as few censorship cuts as possible, in the right aspect ratio, and without the intrusion of oriental subtitles! Years of suffering umpteenth-generation VHS copies ended here, with what are as near-as-dammit definitive versions. The first two films in the collection were not directed by Argento, but were instead produced by him. 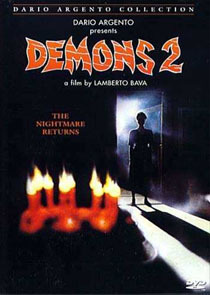 Lamberto Bava directed Demons (1985) and its 1986 sequel, which is also known by its original Italian title: Demoni 2 - L’Incubo Ritorna (The Nightmare Returns). The original film finds a group of people assembled for a mysterious midnight film preview in a dilapidated Berlin theatre. One of them scratches her face on a prop mask on display in the foyer, and turns into a flesh-eating demon. The problem escalates when she infects her first victim, and so on… The rest of the film is rather predictable, pitting the ever-dwindling band of humans against a steadily increasing number of demons. It provides adequate excuse for numerous gory set pieces, which more or less make up for some terrible acting and inane dialogue. The DVD is presented in 1.66:1 ratio, and has Dolby Digital sound. The print is generally very clean and colourful, and runs for 88’30” (the BBFC version ran for 83’52, with 1’05” cuts). The disc also has a trailer, a very brief look at Sergio Stivaletti’s animatronic special effects creations, text-based cast and crew biographies and a full length commentary track, with Bava and Stivaletti. Demons 2 is little more than a straightforward remake. The setting is changed to a high-security tower block and the demons emerge from a TV set showing a late night horror movie, but the main thrust of the film is the same. It lacks the visceral impact of the original but is more resonant when seen on video than its predecessor. The DVD version runs 91’06”, reinstating some of the gore absent in previous US versions, and is presented in 1.66:1 ratio with Dolby Digital sound. A theatrical trailer, text biographies and a notably less interesting commentary track are added attractions. 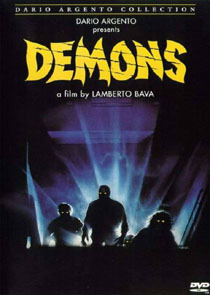 UK company Divid has released a version of Demons that features a number of supplements not on the US disc, including two generic Argento interview segments totalling about six minutes and a lengthier (eight minute) look behind the scenes at various Argento movies, featuring an interview with Sergio Stivaletti. The UK version’s “approx. 88 mins” turns out to be much closer to 84’11” (a little longer than the 83’52” version listed at the BBFC’s website, which was cut by 1’05”), and is billed as “The Director’s Cut” (Divid’s terribly misleading euphemism for “cut in the UK to appease the BBFC”). It doesn’t appear that Demons 2 has ever been cut in the UK. The BBFC list the running time at 87’28”, but Divid’s Region 2 disc clocks in at 87’17”. It contains several extra features, totalling about ten minutes, and, more significantly, a thirteen-minute segment that Mario Bava made for the Mystery TV series in 1987: Turno Di Notte [Night Shift] – Heavy Metal. Sadly Divid have botched the presentation, splitting it into two separate segments, but it’s a very worthwhile addition, and certainly gives the UK disc the edge over the US version. Both US and UK releases seem to be based on the same clean, mildly letterboxed, non-anamorphic transfers, but Anchor Bay’s Region 0 discs have a choice of Dolby Digital 2.0 and 5.1 mixes, whereas the UK discs are in the Pro-Logic 2.0 variant only. 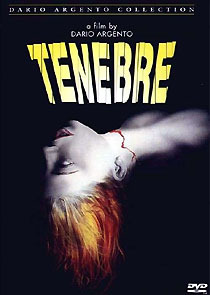 The fun really starts with Anchor Bay’s Tenebrae (it’s spelt Tenebre on the box: technically correct, but far less exotic-sounding!) It’s one of Argento’s best giallo movies, presented in a terrific-looking 1.85:1 transfer with Dolby Digital sound. The film is the 100’27” uncut English language version, not the heavily-cut version seen in the US as Unsane. The film is about a young author (Franciosca) who finds himself at the epicentre of a series of murders apparently being carried out by a deranged stalker. A trailer, behinds the scenes footage (6’33”) and text biographies are included, as is the original version of the film’s end credits sequence (the English language version had a song dubbed over the end credits, against the director’s wishes). A rather frustrating commentary by Argento and composer Claudio Simonetti is another worthwhile bonus. There's a slightly longer version of the film available on Japanese laserdisc, which adds a couple of incidental shots, but no-one but the most dedicated Argento fan will need to seek it out now that this DVD version is widely available. Argento's 1982 flm Phenomena stars the heavenly Jennifer Connelly as a young student who arrives at a girls’ school just as a series of murders begins. It was released as Creepers in some territories (including the version released by Palace in the UK) but was almost half an hour shorter than the version on two different DVD versions: a Region 1 disc from Anchor Bay, and a Region 2 version from Divid. The Palace video ran 79’31”, after 17 seconds of BBFC cuts. The Region 1 Anchor Bay disc tips in at 109’48”, and, as you might expect, is radically different, altering the flow and tone of the movie. The Anchor Bay disc is stuffed with a mouth-watering selection of extra features, as well as being presented in a very sharp transfer with a knockout Dolby Digital sound mix. As well as a rather patchy and taxing commentary track with Argento, Stivaletti and Simonetti there are two related music videos. The first is for a soundtrack cue by Simonetti (4’41”), and features Connolly in footage especially shot by Argento. The second, for Bill Wyman’s “Valley” (4’00”), is directed by Michele Soavi. Both are rather hazy, and may have been shot on 8mm or video. An nine-minute Argento interview from the The Joe Franklin Show, a look behind the scenes at the movie’s special effects work (4’41”) and a trailer complete the package. The print on Divid’s Region 2 Phenomena disc is a significant improvement on the Anchor Bay version: it’s slightly brighter, which reveals more detail, and is helped by the extra resolution afforded by the 16:9-enhanced transfer (which isn’t even mentioned on the sleeve!) Divid have used a print with clumsily inserted French titles, and bearing a brief Arts et Melodie logo’ at the head which they’ve obviously tried unsuccessfully to remove. The film runs for 105’08”, not “approx. 111 minutes”, as stated on the sleeve, or the 105’30” listed at the BBFC website, (possibly accounted for by the later removal of the logo’). The Region 2 disc has several bonus features, including seven minutes of low quality behind-the-scenes footage, two very short interviews hardly worth bothering with, and a music video. Collectors and fans will need to get both discs anyway: the UK one for the transfer and its unique extras, and the US one for the Dolby 5.1 remix, commentary track and its unique extras. Both the Anchor Bay and Divid DVDs seem to be uncut, but are missing a few incidental shots that were present in the Japanese Phenomena – Integral Hard laserdisc. This extra footage is all rather superfluous, and seems to be simply remnants from an earlier edit. All four Anchor Bay discs also have the option of a Dolby Surround (2.0) sound mix. Additionally Tenebrae has a mono Italian soundtrack, and Phenomena has a mono French sound mix.